With over 100 RSVP’s to the event, we’re pleased the Writing for Fantasy Game Worlds panel got so much interest! Panelists Daniel Greenberg, Jeff Gomez, and Steve Balzac captivated the audience’s attention with anecdotes, advice, and frank discussion. 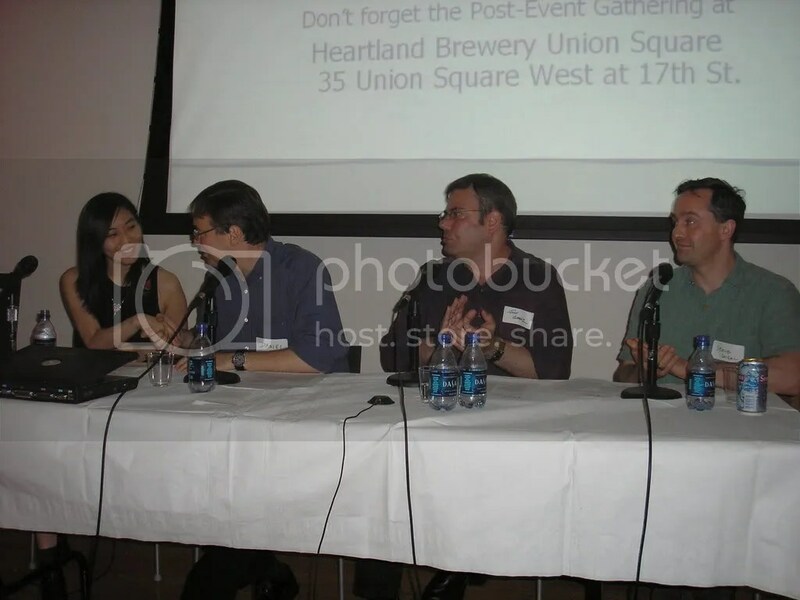 While the purpose of the panel was to delve into the writing and design of fantasy game worlds, it also highlighted the need for writers in game development. Tracing the roots of computer RPGs back to live-action and pen’n’paper RPGs, the panelists stressed the importance of storytelling in audience enjoyment. While computer games often do not live up to its predecessors in terms of storytelling, fantasy titles can still retain a mythic quality. It’s not just the narrative elements of orcs and elves, said Greenberg, but the story itself must resonate with the audience. To do this, Gomez advocated building a story bible that included the mythos and a deep analysis of the themes integral to the property. Greenberg noted that for all the games he worked on that were connected to The Lord of the Rings, he wanted to portray the theme of fellowship. Balzac talked about magic systems and how the story material itself led to the magic system. When he set a game in the world created by H.P. Lovecraft, he ended up writing the Necronomicom with its dark arcane magic. Magic would not be a simple zap in this world. Players would have to read through tomes of secret knowledge to learn spells. The panelists were hopeful that game developers would pay more attention to storytelling in the future. This would involve more interesting choices, rather than a set “good” path and a “bad” path. Stories need to be better than just backdrops. In addition, aspiring game writers were told to be cognizant of game design and level design disciplines. When it was all over, people wanted more. One question was about conducting future workshops on game design and writing. We’re still mulling it over. But we’ll let you know. Thanks, game developers! We're growing — what do you want to read? Woohoo! This blog was recognized as one of the top 100 growing blogs. That’s us, just narrowly edging out a woman named Miruna, writing a novel in Romanian, apparently. That said, we couldn’t have gotten this far without you, dear reader, so we throw ourselves at your mercy. Are you getting what you want out of this blog? As a developer, do you want to read more or less of the following, or something else entirely? E-mail us or drop us a comment. If you’re a developer, we’ll send you some swag in thanks. We’ll even take requests to stop reading so much Gamasutra! The landmarks of San Francisco are very beautiful, especially when made in Jell-O. What landmarks do you recognize? Unity of Space, Unity of Time, and interpret my notes! I was cleaning today (fear me!) and I came across notes from, oh, I’d say 6 years ago or so. Before I introduce them to the trashcan, I thought I’d put them down here. I think these are part of the unities of Aristotle or some Greek dude, but I no longer recall. 2. Unity of Time – Why wait? Always pull it up. It, meaning action and plot. Now, was I writing about irony, and then wrote down that tension was good? Or was I saying that irony is good because it means tension? If so… I’m trying to think of an example where good irony led to tension. In the Sixth Sense, Bruce Willis treats the kid who sees dead people, when it turns out he himself is dead. Or a ticking bomb in a playground only the audience knows about. Seems like a lot of irony deals with the audience knowing or not knowing some vital info. Got a better example of irony? I’m sure there’s plenty. IGDA and Writers Cabal present… tonight! Moderated by Sande Chen, the panel will explore the overwhelming appeal of fantasy computer games and the importance of writing and story development in world building and player immersion. From pitch to production, from pen-and-paper and live-action to massively multiplayer game worlds, the panelists discuss the process of fantasy world building for original concepts or licensed properties. Furthermore, they elaborate on how story development can affect game system design, character design, and environments. We’re writing for a project with a unique mandate: make it easy to translate into French. This is a challenge because we do not know which gender the player will choose to play. This problem must be unique to game writing, so we thought we’d write up a little cheat sheet for people writing in English who may not know what problems the French translators may encounter. 2. Avoid “etre” verbs in the simple past tense and future perfect when the subject is gender unknown. Fortunately, there are only 16, but they’re pretty major: to come, to arrive, to enter, to climb, to stay, to return, to turn back, to be born, to go, to depart, to leave, to get down, to fall, to come back, to become, to die. Click here to find out more about verbs that take etre. 3. Avoid reflexive verbs in simple past or future perfect with the subject an unknown gender. So what are reflexive verbs? These types of verbs inherently reflect back on the subject, ie “I hurt myself,” “I washed myself.” Less obviously: “To amuse oneself,” “to have fun,” and “to be interested” also fall into this category. 5. Watch for plural subjects with one gender unknown. The above rules dealt mostly with singular masculine or feminine. However, you may find an instance where the unknown gendered person is referred to in a group. If this group consists entirely of males, or males and females, then you can proceed with impunity. However if the group may consist entirely of females, or may not depending on user choice, you will have to follow the guidelines above. Next week: gender unknown for Yemeni Arabic. Just kidding! You don’t want to know about the duals. Do you find these guidelines similar for other romance languages, such as Spanish? Would you find it helpful to learn about other languages’ issues? What do you foresee as the benefits and drawbacks of this trend?